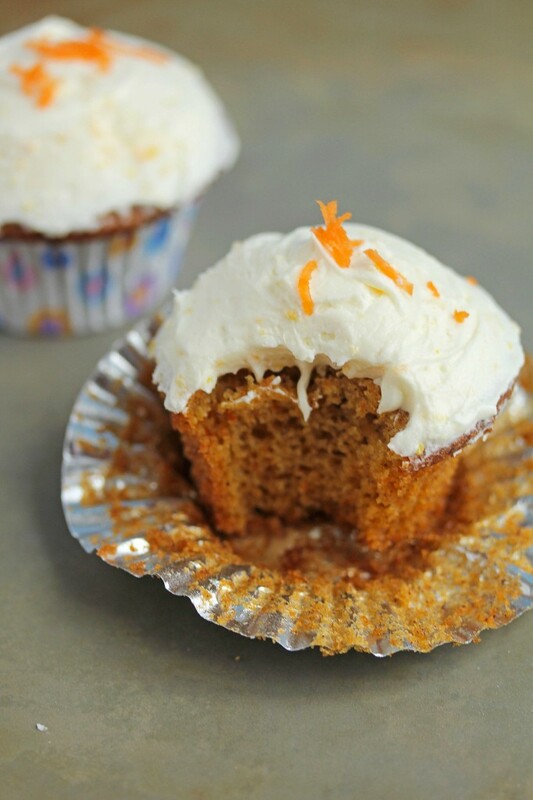 Perfect Orange Carrot Cupcakes that will make your taste buds sink! Great flavor throughout and a classic done with a twist! I’m excited to share my next recipe from Style Me Pretty Living today. With Easter right around the corner, I thought some carrot cupcakes would be great to share. But these aren’t just any carrot cupcakes, these are orange carrot cupcakes. I love citrus flavor paired with spiced cakes. The hint of orange really brightens the spices and carrot in this recipe. And the best part is the cupcake batter is very easy to make. I also made it a bit lighter with the addition of greek yogurt (orange flavored at that!). 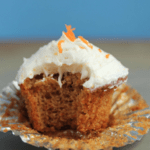 The orange zested buttercream is really a treat and the perfect compliment. 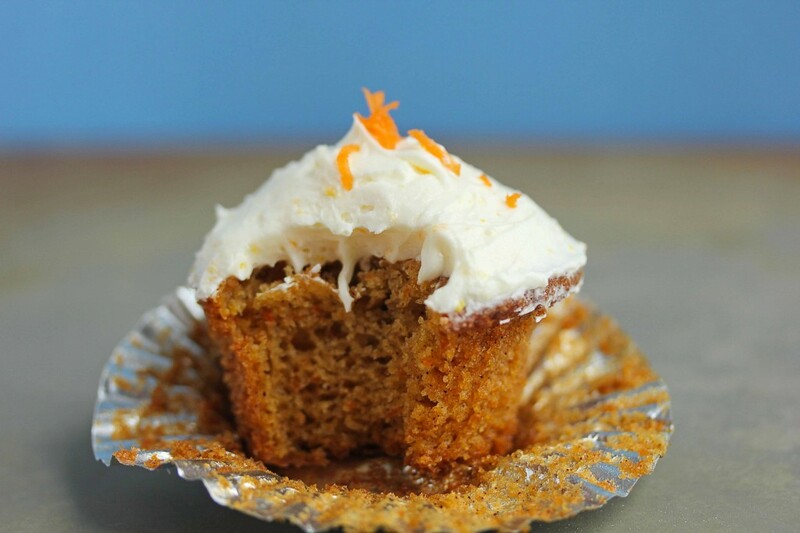 If orange carrot cupcakes sound delicious, check out the recipe below. In one large bowl, add pureed carrots, granulated sugar, greek yogurt, oil, beaten eggs, and vanilla extract. In a separate bowl, sift together flour, baking powder, baking soda, salt, cinnamon, and nutmeg. Scoop batter into cupcake lined muffin pan. Bake for 23-26 minutes or until toothpick inserted into center comes out clean. Add butter to the bowl of your mixer and slowly mix in powdered sugar then turn mixer to high to blend until creamy. Add in your orange juice and zest until smooth. Frost cupcakes after they have completely cooled then serve. I made these today and I the recipe yielded 10 full-size cupcakes. They were a great texture and they really rose a lot. They were light and moist and quite sweet from the pureed carrots, and the orange really came through. We couldn’t detect the carrot flavor though. They were a good cupcake, just not carroty. Thanks for the recipe, Jocelyn. Curd and orange essence or orange juice ? I would still use a thicker yogurt or you can use sour cream and flavor it with orange extract. Hi Jackie, you boil the carrots until they get soft. This recipe makes about a dozen cupcakes and I used yoplait orange flavored yogurt in this recipe but any brand will work. Let me know if you have any additional questions. Carrot cake in a cupcake.. such a brilliant idea. And the orange flavor combo with it.. I never would have thought of but sounds absolutely amazing! Thanks so much Ally! I love the combo! OMG these look delicious! I was looking for the perfect Carrot Cake recipe to make for Easter and this is it! You sold me with the orange frosting! Question, I was really wanting to make a cake as I already promised to bring one to our family dinner, could I make it the exact same way but into a full on cake? Would the cooking times be the same and the amount make enough for a layered cake? Any suggestions would be appreciated, thanks! Hi Colby, so great to hear that!!! For this recipe you would definitely need to check the baking time since it wouldn’t be the same as your cupcakes. I haven’t tried this recipe as a layer cake but most cupcake recipes can be transferred into cakes. I’m a huge fan of carrot cake. After all, it was my wedding cake. 🙂 Love the addition of orange to this spring classic. I can see how these would be a hit! OMG it was your wedding cake? That is just so awesome Ashley!! Citrus and spices is so creative! And I love the recipe name 🙂 these look amazing Jocelyn! What a great idea to add orange to carrot cake. It’s a natural pairing of course! Happy Easter, Jocelyn! I love orange with carrot!! Thanks so much Helen!! How do you puree carrots. Hi Jackie, you can simply grind it up in your food processor after softening the carrots by boiling them. Or if you want a true carrot cake finish you can just grind them in the food processor. How long do you boil them and how many cupcakes do this recipe make. Glad to see you in the carrot cake spirit right now too! These look delicious! Orange and carrot pair so well together! I love using citrus zest in recipes – they really add something extra. carrot cake cupcake! such a simple and great idea! Thanks so much! Agreed!!! Simplicity sometimes wins out! I love carrot cake but I never thought to try orange with it! Pinning! Thanks so much Marcie! I love the combination too!